Unlike most industrialized countries, which have widespread private land ownership and a free real estate market, in Israel the state controls 93 percent of the land.53 This land is owned either directly by the state or by quasi-governmental bodies that the state has authorized to develop the land, such as the Development Authority (DA)54 and the Jewish National Fund (JNF).55 A governmental body, the Israel Land Administration (ILA), administers all of this land.56 This gives the government an exceptionally decisive role in land allocation, land-use planning, and development. Israel has three types of local governments or local authorities: municipalities (governing individual cities), local councils (governing individual villages and towns larger than 2,000 people), and regional councils (governing a number of villages with fewer than 2,000 people and generally with jurisdiction of the land between the villages). 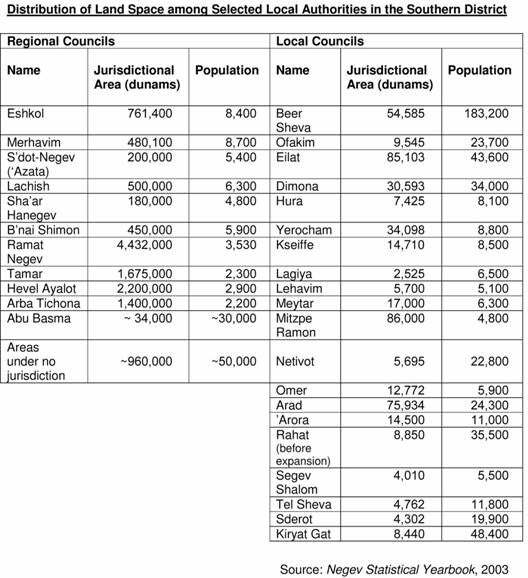 The following chart produced by Bimkom, an Israeli NGO promoting equality in planning, shows the stark difference between the land jurisdiction of Jewish and Bedouin local authorities in the Negev. In the Negev today many Jewish localities are expanding and new ones are being created. The spokesperson of the Bnei Shimon Regional Council, in the northern Negev, told Human Rights Watch that many of the council's kibbutzim and moshavim (collective farming communities) are developing new neighborhoods and each is planning to add more than a hundred new homes.75 On the other hand, planning officials have not allocated sufficient land for the residential, infrastructural, and livelihood needs of the seven government-planned Bedouin townships in the Negev or the newly recognized villages. The government is actively pressuring Bedouin to relocate to these overcrowded and failing townships rather than allocating them additional land, recognizing the unrecognized villages, or allocating land for new rural communities. The policy of individual farms has been criticized by Israeli state planners,86 yet in September 2005 planning officials approved the Wine Route Plan, the most extensive plan for individual farms to date.87 Submitted by the ILA at the request of the Ministerial Committee for the Development of the Negev and the Galilee, the plan authorizes the construction of 30 individual farms, 20 of which already exist, within the Ramat HaNegev Regional Councils jurisdiction. While state officials marketed the plans tourism features, their main goal appears to be to legalize retroactively existing individual farms that were built illegally, and to construct new ones.88 The plan is remarkably similar to an earlier plan for individual farms in the Negev that the ILA and Ramat HaNegev officials promoted as a means to help prevent the takeover of Negev lands by the Bedouin and to strengthen the Jewish population in the region.89 The Israel Union for Environmental Defense (Adam Teva VaDin) had petitioned the Supreme Court protesting the previous plan, and the Supreme Court had canceled the plan in 2001. Later Abu Solb took Human Rights Watch on a tour of his old village, pointing out many landmarks from his childhood, including areas where he had picnicked with his grandparents, and the site of his former home. The only time of which Human Rights Watch is aware that a Bedouin has successfully been granted admission to a rural Jewish community was in 2007, on appeal, after the selection committee initially rejected his application to live in Givaot Bar. In 2005 several Bedouin applied to live in Givaot Bar, a rural community founded on land claimed by Bedouin. One of the Bedouin applicants was rejected by the selection committee and submitted an appeal to the appeals committee, which ultimately overturned the decision of the selection committee and recommended that the Bedouin applicant be admitted to Givaot Bar.108 At the time of writing, the other applicants had still not received a response. 53 According to Israel's Basic Law: Israel Lands (1960), lands controlled by the state, the Development Authority and the Jewish National Fund are known as "Israel Lands." State lands can be divided between those belonging directly to the state71 percent (15.3 million dunams or 3.825 million acres); those belonging to the Development Authority16 percent (2.5 million dunams or 0.625 million acres); and those belonging to the Jewish National Fund17 percent (2.6 million dunams or 0.65 acres). Adalah, Land Rights and the Indigenous Palestinian Arab Citizens of Israel: Recent Cases in Law, Land and Planning, Submitted to the Secretariat, UN Working Group on Indigenous Populations, 26 April 2004, p. 2. http://www.adalah.org/eng/intl04/unIndigpop.pdf (accessed November 16, 2007). 54 The Development Authority is a governmental agency established in 1952 (under the Transfer of Property law 5710-1950) to administer the lands of Palestinian refugees and make them available to the state for developing new settlements. 55 The Jewish National Fund was established in 1901 with the aim of acquiring land in Israel for the settlement of Jews. Under Israeli law the JNF enjoys a special status and is granted the privileges of a public authority. The 1961 Memorandum and Articles of Association of the JNF state that the ILA will administer all JNF-owned lands and that the objectives of the JNF remain to acquire property in Israel for the purpose of settling Jews on such lands and properties." The JNF interprets the Memorandum as prohibiting the allocation of its lands to non-Jews. Information taken from Statement submitted by Adalah and Habitat International Coalition to the UN Commission on Human Rights at their Sixty-Second Session, 13 March  21 April 2006, Item 6 of the Provisional Agenda. http://www.adalah.org/eng/intl06/un-i6-jnf.pdf (accessed November 20, 2007). 56 The Basic Law of 1960 established the ILA, an agency that manages 93 percent of Israels 19.5 million dunams (78 million acres). See ILA website, http://www.mmi.gov.il/Envelope/indexeng.asp?page=/static/eng/f_general.html (accessed May 21, 2007). The ILA operates under the authority of a government ministry, although which ministry has changed over time. As of May 7, 2006, the ILA is under the Construction and Housing Ministry (Israeli Cabinet Meeting Minutes, May 7, 2006, on file with Human Rights Watch). It was previously under the Ministry of Industry, Trade and Employment. 57 Israel's Basic Law: Israel Lands (1960). See also ILA website. 58 According to the JNF, it owns 13 percent of the land of Israel, about half of which is settled. The JNF claims that 70 percent of the Israeli population lives on land owned by the JNF. See Stuart Ain and Joshua Mitnick, Land Sales To Arabs Could Force JNF Changes, The Jewish Week, February 4, 2005, http://articles.findarticles.com/p/articles/mi_hb5092/is_200502/ai_n18522798 (accessed November 20, 2007). 59 While the Israeli Supreme Court held in its March 2000 decision on the Qadan case that the State could not "allocate State land to the Jewish Agency for the establishment of the Katzir community settlement on the basis of discrimination between Jews and non Jews", in practice that decision has not been implemented. The Qa'dan family is still not living in the community of Katzir, the focus of the case, and the State and the ILA have found ways to bypass the Supreme Court decision. In July 2007 the Knesset, in its first reading, approved a bill which calls for all lands under the JNF to be allocated to Jews only. The bill passed by a majority of 64 MKS to 16. The bill must pass two additional readings before it becomes law. 60 The human rights organization Adalah challenged this policy in a petition to the Israeli Supreme Court in October 2004. See H.C. 9205/04, Adalah et al. v. The Israel Land Administration et al. (case pending). According to media reports, Israels attorney general responded to the petition by saying that the ILA cannot discriminate against Palestinian citizens in the marketing and allocation of lands including those of the JNF, but the Supreme Court has not handed down a judgment on the case. See Yuval Yoaz and Amiram Barkat, AG Mazuz Rules JNF Land Can Now be Sold to Arabs, Ha'aretz , January 27, 2005. The Association for Civil Rights in Israel and the Arab Center for Alternative Planning also filed a petition to the Supreme Court in October 2004 challenging the ILA's discriminatory policy. See H.C. 9010/04, The Arab Center for Alternative Planning et al. v. The Israel Land Administration et al. (case pending). All information in this footnote taken from Adalah and Habitat International Coalition Statement to UN Commission. 61 See ILA website, http://www.mmi.gov.il/Envelope/indexeng.asp?page=/static/eng/f_general.html. 62 Adalah and Habitat International Coalition Statement to UN Commission. 63 Ibid. See also Arnon Golan, "The Acquisition of Arab Land by Jewish Settlements in the War of Independence," Catedra, vol. 63 (1992), pp. 12254 [Hebrew]; Yifa'at Holtzman-Gazit, "The Use of Law as a Status Symbol: The Jewish National Fund Law  1953 and the Struggle of the JNF to Establish its Position in the State,  Iyoni Mishpat, vol. 26, pp. 60144, July 2002 [Hebrew]. 64Israel's 1950 Absentees’ Property Law, 5710- 1950 allowed the state to confiscate the land and homes of Palestinian refugees or internally displaced persons who were not present on their property as of 29 November 1947. Estimates vary as to how much land the state confiscated under this law. One estimate says that in 1954, more than one third of Israel's Jewish population lived on absentee property and nearly a third of the new immigrants (250,000 people) settled in urban areas abandoned by Arabs. Of 370 new Jewish settlements established between 1948 and 1953, 350 were on absentee property (Don Peretz, Israel and the Palestinian Arabs, Washington: Middle East Institute, 1958). 65 Adalah and Habitat International Coalition Statement to UN Commission. 66 Shmuel Groag and Shuli Hartman, Planning Rights in Arab Communities in Israel: An Overview, http://www.bimkom.org/dynContent/articles/PLANNING%20RIGHTS.pdf (accessed May 21, 2007). 68 Abu Ras, Land Disputes in Israel, Adalah Newsletter. 69 I. Peleg, Jewish-Palestinian Relations in Israel: From Hegemony to Equality? : Palestinian-Israeli Relations, International Journal of Politics, Culture, and Society, vol. 17, no. 3, 2004 , pp. 415-437(23). 70 Two of the Arab regional councils are located in the Northern DistrictBustan al-Marj and al-Batoufand one is located in the Southern District  the recently-created Abu Basma Regional Council covering the municipal territory of the newly recognized Bedouin villages. 72 Abu Basma size taken from Selected Data section of the The Negev Development Authority website http://www.negev.co.il/ (accessed September 18, 2007). 73 Taken from websites of Bnei Shimon and Ramat HaNegev Regional Councils http://www.bns.org.il/site/he/eCity.asp?pi=1193 and http://ramat-negev.org.il/ [Hebrew] (accessed June 18, 2007). 74 Taken from websites of Bnei Shimon and Ramat HaNegev Regional Councils http://www.bns.org.il/site/he/eCity.asp?pi=1193 and http://ramat-negev.org.il/ [Hebrew] (accessed June 18, 2007). 75 Email to Human Rights Watch from Oshra Segal, Bnei Shimon Regional Council spokesperson, March 21, 2007. 76 Nili Baruch, Spatial Inequality in the Allocation of Municipal Resources, Adalah Newsletter, vol. 8, December 2004. 77 Protocol of December 4, 2006 meeting of the Knesset Internal Affairs and Environment Committee on Master plans of Bedouin settlements in the Negev and home demolitions (on file with Human Rights Watch), http://www.knesset.gov.il/protocols/data/html/pnim/2006-12-04.html [Hebrew] (accessed May 23, 2007). 78 Information taken from Ramat HaNegev Regional Councli website [Hebrew], http://www.ramat-negev.org.il/ (accessed May 21, 2007). 80 All the rural communities have strict acceptance policies and the Jewish Agency is involved in the applications for some of them. See section on Selection Committees, below. 82 Hamdan, Individual Settlement in the Naqab, Adalah Newsletter. The Green Patrol was created by then-Minister of Agriculture Ariel Sharon in 1977, and operates as an enforcement arm of the Ministry of Agriculture and the ILA. The Green Patrol is much reviled in the Bedouin community and referred to as an environmental paramilitary unit. The Green Patrols methods include pulling down Bedouin tents, confiscating livestock, and destroying crops planted without the appropriate permit, all in the name of protecting Israels green spaces and agricultural land. The State Comptroller severely criticized these plans for their attempts at circumventing standard planning procedures and developing the land in order to populate the farms exclusively with Jews. Ibid, quoting State Comptrollers Annual Report for 2000, p. 602. 83 Zafrir Rinat, "Sharon is promoting establishment of 30 settlements in the Negev and Galilee," Haaretz, July 20, 2003 http://www.haaretz.co.il/hasite/pages/ShArtPE.jhtml?itemNo=319936&contrassID=2&subContrassID=1&sbSubContrassID=0 [Hebrew] (accessed September 9, 2007). 84 ILA paper on Bedouin in the Negev available on ILA website, http://www.mmi.gov.il/static/HanhalaPirsumim/Beduin_information.pdf (accessed May 21, 2007). 85 Letter to Human Rights Watch from the Ministry of Justice, July 23, 2007. 86 Planners involved in creating National Master Plan (TAMA 35) submitted an expert opinion to the National Board for Planning and Building in July 1999, stating that TAMA 35's team views the policy of individual settlements as a great danger as it is a means of population dispersion and 'land seizure,' which are not regulated or controlled by the planning system. The plan also contradicts the principles stated in other master plans including Master Plan for Israel 2020, adopted by the government in 1996, and the recently adopted National Master Plan 35, that clearly emphasizes the need for urban density and the preservation of open spaces as paramount planning values. See Adalah Petitions Supreme Court to Cancel Wine Path Plan for Individual Settlements in the Naqab, Adalah Newsletter, vol. 24, April 2006. 87 The plan was approved by the Sub-Committee on Planning Principles, under the auspices of the National Council for Planning and Building, according to Oren Yiftachel, Inappropriate and Unjust: Planning for Private Farms in the Naqab, Adalah Newsletter, vol. 24, April 2006. 88 Adalah Petitions Supreme Court to Cancel Wine Path Plan for Individual Settlements in the Naqab, Adalah Newsletter. 89 Yiftachel, Inappropriate and Unjust, Adalah Newsletter. 90 Adalah Petitions Supreme Court to Cancel Wine Path Plan for Individual Settlements in the Naqab, Adalah Newsletter. The case is H.C. 2817/06, Adalah et al. v. The National Council for Planning and Building et al. (case pending). 91 Adalah Petitions Supreme Court to Cancel Wine Path Plan for Individual Settlements in the Naqab, Adalah Newsletter. 92 Ibid. One of the planning principles Yiftachel refers to is the preservation of open spaces and natural landscape. 93 Yiftachel, Inappropriate and Unjust: Planning for Private Farms in the Naqab, Adalah Newsletter. 94 Information taken from letter to Human Rights Watch from the Ministry of Justice, July 23, 2007. 95 Human Rights Watch interview with Nuri al-Ukbi, Beer Sheva, April 3, 2006. 96 Human Rights Watch interview with Sheikh Awde Abu Muamar, Sahel al-Bakkar, April 6, 2006. 97 Human Rights Watch interview with Mohamed Abu Solb, shop across from Bir Mshash, March 30, 2006. 98 Human Rights Watch interview with Ariel Dloomy, Rahat, March 29, 2006. 99 The legal basis for the evacuation lawsuits is Article 17 of the 1969 Land Law. 100 Human Rights Watch interview with Salim Abu Alqian, Um Heiran, March 29, 2006. 101 Human Rights Watch interview with Ibrahim al Atrash, al Atrash, March 27, 2006. 102 Selection committees were established and governed through Resolutions of the ILA. The current Resolution governing the selection committees is Resolution no. 1064 of Israel Land Administration Council from July 27, 2005, which updated Resolution no. 1015 from August 1, 2004. 103 According to article 2 of Resolution no. 1064 as quoted in a letter to Human Rights Watch from the Ministry of Justice, July 23, 2007. 105 Living in Sophisticated Rakefet, Haaretz, February 16, 2007. 107 Human Rights Watch interview with Ariel Dloomy, Rahat, March 29, 2006. 108 According to Resolution 1064, rejected applicants have a right to appeal to an appeals committee, headed by a public figure and consisting of representatives of the Register of Cooperative Societies and a representative of the ILA.